Lamb curry, also known as Rogan Josh, is one of India’s most typical meat dishes. Each chef makes the dish based on his/her favourite spices, but nevertheless, saffron is not usually missing from the dish. In our case, saffron from La Mancha and from India, saffron from the Kashmir region. We have taken this recipe from the Lonely Planet’s Indian cookbook ‘My recipes made in India’. It is a recipe that serves four people, that you will have ready in 20 minutes, plus 55 minutes of additional cooking time. Nevertheless, the meat will have to be marinated, at least, for six hours. 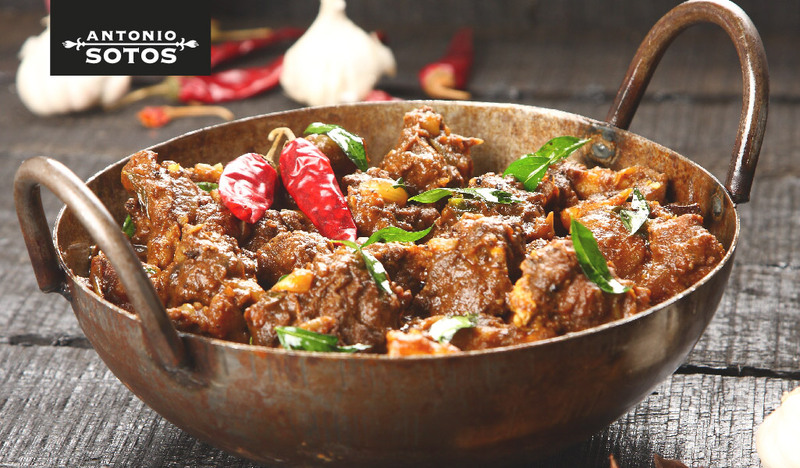 Therefore, our tip is for preparing this saffron lamb curry, is to marinate the meat the day before. Split the cardamom pods and extract the seeds. In a frying pan on a high flame, brown the cumin and cardamom for 20 seconds and set aside. Deseed and chop the chillies. Peel and chop the garlic. Peel and chop the ginger. In a mortar, using a pestle crush the garlic, ginger, chilli peppers, cloves, cumin and cardamom to a smooth paste. These ingredients can also be crushed in a blender. Add a teaspoon of Garam Masala and sprinkle with the lime juice. Dice the lamb and add into a bowl. Add the spicy mixture to the diced meat and mix thoroughly so that the lamb pieces are coated and infused with the spices. Leave to marinate, for, at least, six hours, stirring occasionally. Peel and chop the onions. Melt the butter in a frying pan and sauté the diced meat for 5 minutes, stir. Add the chopped onion and leave to sweat for approximately 8 minutes. Add the bay leaves and 40 cl. of water. Lower the heat to a simmer and cover partially so as to cook for 30 minutes. Meanwhile, in a small bowl soak the saffron strands in 3 tablespoons of warm water. Uncover the frying pan and leave to reduce if necessary. Add the yogurt, a little at a time, stirring constantly to prevent it from curdling, saffron and season. Add the almonds and poppy seeds and cook on a very low heat for 10 minutes. Just before serving, sprinkle the remaining Garam Masala on top.